How are XML records created? Why do we use XML? Cultural heritage professionals have high levels of training in metadata. However, the institutions in which they practice often depend on support staff, volunteers, and students in order to function. With limited time and funding for training in metadata creation for digital collections, there are often many questions about metadata without a reliable, direct source for answers. 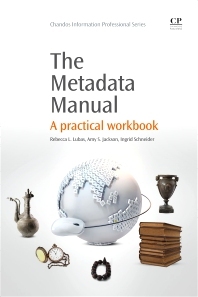 The Metadata Manual provides such a resource, answering basic metadata questions that may appear, and exploring metadata from a beginner’s perspective. This title covers metadata basics, XML basics, Dublin Core, VRA Core, and CDWA schemes and provides exercise in the creation of metadata. Finally, the book gives an overview of metadata, including mapping and sharing. Rebecca L. Lubas is Director, Cataloguing and Discovery Services at the University of New Mexico Libraries, where she coordinates a group of catalogers. Rebecca was previously Head of Cataloging and Metadata Services and Special Formats Cataloger at the Massachusetts Institute of Technology (MIT) Libraries, and a founding member of the Metadata Services Unit at MIT. Rebecca holds an MA in English Literature from Ball State, an MLIS from Louisiana State University, and a BA from the University of Notre Dame, USA. She is the Editor of Practical Strategies for Cataloguing Departments. Amy S. Jackson is a Digital Initiatives Librarian at the University of New Mexico where she works with digital projects and the institutional repository. Prior to moving to New Mexico, Amy was the project coordinator for the IMLS-funded Digital Collections and Content project at the University of Illinois at Urbana-Champaign. Amy received her MLIS from Simmons College in Boston, Massachusetts and also holds a master's degree in music from the Peabody Institute of the Johns Hopkins University, USA. Ingrid Schneider is the Metadata and Authority Control Librarian at New Mexico State University (NMSU), where she has been working to lay the foundation for a dedicated digital initiatives unit, and works daily on building the NMSU Library’s inaugural digital collections. Ingrid received her MLS from Indiana University, and holds Bachelor’s Degrees in English and German from Ohio University, USA.